Amita – My childhood memories are vivid and full of events that encouraged me to pursue art. I have had an adequate exposure to art since childhood which enriched my thought process naturally. Art and colours are an integral part of my life. My works are inspired by real life experiences, human emotions, social issues and nature. Humanity, life and nature have always been my inspiration and have influenced my works. My extensive experiments with colour and texture have led to the development of an individual style in this creative pursuit. BalwinderTanwar – For me painting is a medium to express my inner self that transcends beyond the spiritual experience. While painting, ideas floats from the subconscious and, I try to transform those ideas gently with the help of human and sometimes non-human forms. In these works I had experimented with the human forms re-arranging them in my own colours and compositions to provide a new sight of social life. Charu Goel – For me Art is ‘Satyam ParamDhimahi’ means ‘I meditate upon the supreme truth, GOD’. Thus my energy towards my work is guided by the Supreme power. Art is to know the creativity within, an expression of my own self, an inner pursuit of the soul, peace tranquillity, harmony, love, humanity and happiness. My idea is to create something pleasant, vibrant and soothing so that it throws positive vibes, and relaxes the mind of the onlooker or the possessor and to gives a new dimension to the wall of his inner being. My message is to live life to its fullest, to see all the bright colours of life between white and black; Positive and negative; Life and death; and to understand how the whole cycle work towards humanity at large, because that is key to inner success and happiness. Harminder Boparai – I have a passion for all the discarded things and am even a compulsive hoarder. What seems unappealing or quirky to others is inspiration to me. I look for my object of beauty at unlikely places – in waste bins and garbage dumps – and transform the objects of my fancy into three-dimensional figurines. I love turning the everyday objects into interesting things. This is also my way to conserve nature by recycling metal. Kishore Shanker Chawla – My art works are reflection and a visualization of my thoughts. I believe art survives in every single moment of our lives; it flows like a breeze, like water, like a thought… uninterrupted. I am fascinated by light and try to capture that bright, illuminated spot in my photographs. In the absence of it I attain it in through Photo-Graphics. My works are an amalgamation of digital photography along with computer graphics achieved through strings of my experimentation with the medium. In my paintings, I try to bring in some of the important and sensitive issues of our society like Gender detection and female feticide, Global Warming, Wildlife Protection and Human struggles for survival. Zodiac signs are another area of my keen interest in my paintings. Lohit Sharma – I did my BFA in Sculptures from College of Arts, Delhi and enjoyed the period of learning there. I started up my sculptures with metal and fiber. Later, I experimented more with metal and recreated some innovative form of scooter for instance as a Swan. Later my creativity took another dimension and I started working with metal and real bones. Using different themes and applying the versatility of different metals I worked on the human anatomy and bones with specifications as backbone, hip bone etc. I started using feathers to my metal structures to achieve a more inventive form and I feel that the use of feathers affix some liveliness to my sculptures. Mahmood Ahmad – As a child, I would translate my feelings into portraits, the visages expressing joy or sorrow, screaming with pain & anger or just smiling enigmatically, was an expression of my own inner turmoil and emotions. Thus my journey as an artist began quite early. My father was the vice Principal of Jamia School, which was adjacent to the Department of Fine Arts, JamiaMilliaIslamia. As a child I was deeply fascinated by nature. Jamia with its semi wild surroundings was an ideal playground for a young naturalist like me. I would spend hours in the forest gathering caterpillars and their pupae. I would take my collection back home and observe the eggs evolve into butterflies with all their splendid beauty. The fragile wet wings of the butterflies would harden upon emerging from the pupae and the butterfly would eventually fly off giving me immense joy. Later this childhood passion development into a deep and abiding interest and I think metaphorically, art is also like a butterfly emerging from a pupa. My encounter with nature and its beauty, finds its way into my work. Eventually I graduated from the Department with a Degree in Fine Arts. N P Pandey – Being originally trained in Graphics, my paintings confine to linear beauty, power of line and texture. Mostly I work with pen & ink and charcoal or otherwise use the acrylic colour for my canvases. I am very much inspired by the traditional Indian mural paintings of Ajanta. My other inspirations are- Amrita Shergil the great women painter of India and the well-known modern Indian painter Jagdish Dey. I mostly work on the theme of life and feminine power and induce them using colour and texture. Nirmal Thakur – Since last eighteen years I have been quietly working in my way. Whatever I feel, good or bad, I try to portray it through colour and brush irrespective of the medium- canvas, paper, jute or any suitable surface. I have always been fascinated by lotus for their immense beauty and growth despite of their origin. They leave an impact on everyone through their inner peace, purity and tranquillity. I have heard somewhere that talent is an innate quality and God’s Precious gift to one, so I believe whatever one brings forth through his or her talent is a return gift to God. Ravindra Tanwar – I think Photographs not only just preserve a moment but also shares one own point of view with others. The pictures captured by me are not mere an image, my works are however the reflection of my thoughts and observation around me. I enjoy taking photographs of traveling, people, animals, and objects in their surroundings. These works are an exploration of human presence and indivisible relationship with the nature as well as the materialistic world. So, on the whole Photography for me is self-discovery, meditation and a way out for my thoughts. It’s about how I define myself and my emotions. ARTINFOINDIA.COM, an organization dedicated to visual arts is based in Gurgaon. It is managed by a team of artists and professionals. As the founder says – We are an association with a dream to promote aspirants working on subject called ‘ART the ORIGINAL’ and with ambition to introduce all our friends to concept known as ORIGINAL ART. The organization also diversifies in providing information on various allied services like listing of Art Events/Exhibitions, Art Galleries, Auction Houses, Art Schools/Institutes, NGOs, Online Services/Websites, Art Publications/Books, Artists and Art News etc. We also organize camps, workshops, lectures and give Awards/Scholarships in the field of art shortlisted by eminent jury. The purpose of this exhibition is to create a common platform for the artists across the country barring their medium of work. We do not limit the age or qualification for judging the quality of art works and present it to the viewers to enjoy and bestow their opinion. 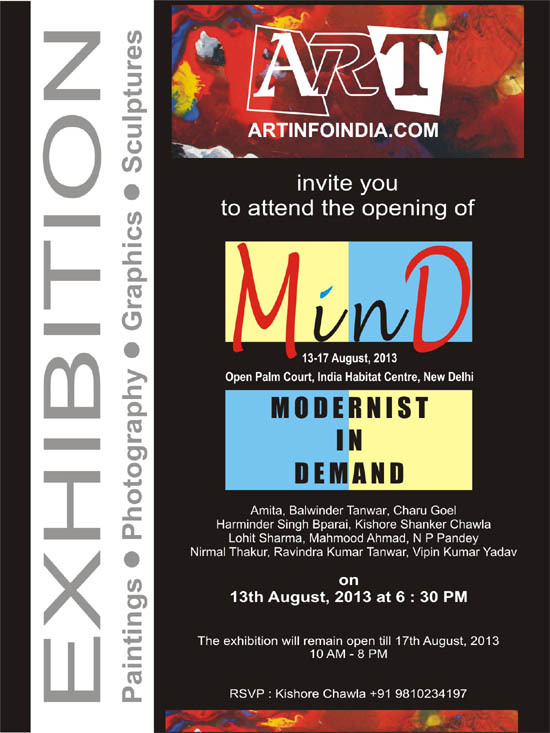 Look forward to have all of you with us in August 2013 at the Open Palm Court, India Habitat Centre,New Delhi and grace this exhibition with your presence.